Hillary Clinton has just announced Virginia Sen. Tim Kaine will be her vice presidential running mate. Black is an associate professor of economics and law at the University of Missouri-Kansas City. A former bank regulator who led investigations of the savings and loan crisis of the 1980s, he is the author of the book The Best Way to Rob a Bank is to Own One. “By picking Tim Kaine, Hillary Clinton has shown her revealed preferences. It’s not what you say, it’s what you do. “Clinton can talk about caring about the U.S. public, but this choice cuts through the rhetoric. 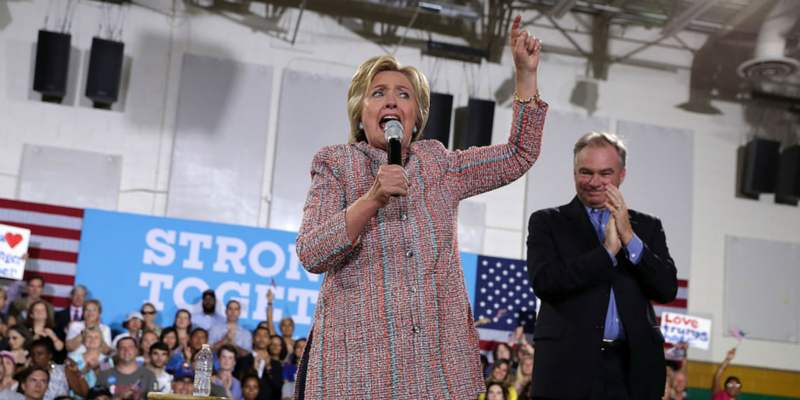 Kaine — like Clinton herself — is a quintessential ‘New Democrat’ — meaning they are allies of Wall Street. They embrace a neo-liberal, pro-corporate outlook that has done incredible damage to the vast majority of Americans. “What’s especially noteworthy about this is that they are doing this while the Republican party is repudiating some of these policies. The Republican Party platform calls for reinstating Glass Steagall. This New Deal reform was overturned by Bill Clinton. The Republican platform is for putting it back and the alleged liberals Clinton and Paul Krugman are against reinstating it. “This shows Hillary Clinton hasn’t learned a thing from the failed pro-Wall Street policies that have wrecked the economy. It’s bad politics and it’s bad policy. “Actually, that’s not quite right. These policies have worked brilliantly for the top 1/1000th of one percent. They have been disastrous for nearly everyone else in the U.S. — and around the world.